In a pitcher mix pineapple syrup and sprite. Take 2 glasses. 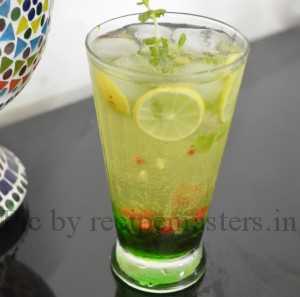 Put 5-6 mint leaves, few lemon slices in each glass and mash or muddle it well with a spoon. Pour around 1 tbsp mint syrup, fill half the glass with ice cubes and pour pineapple syrup mixed sprite and fill up the glasses. Serve chilled garnished with few pomegranate seeds.